Another building that is on the “must see” list for visitors to Florence is the Palazzo Vecchio, the “Old Palace.” Originally called the Palazzo della Signoria, after the Signoria, the ruling body of the Republic, it has also been known by several other names over the years: Palazzo del Popolo, Palazzo dei Priori, and Palazzo Ducale, depending on its function at the time. Naturally enough, while all of the other tourists were looking at the replica of Michelangelo’s David out front of the main entrance, I was photographing the heraldry and coats of arms with which it is decorated. This impressive display sits over the main entrance from the Piazza della Signoria out front of the Palazzo. In addition to the blue background covered with gold fleurs-de-lis (more likely in respect of the Duke of Anjou and not the King of France), there is also, front and center, the arms of the Populace of Florence (Argent a cross gules) flanked on each side by the arms of the City of Florence (Argent a fleur-de-lys florency gules). 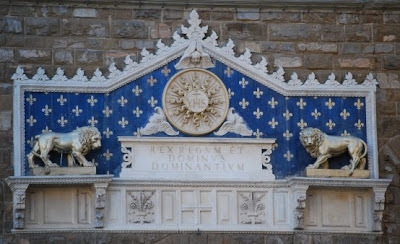 But the real display of heraldry is underneath the overhang of the top floor of the building, where under each arch is a coat of arms, including all of the usual public heraldry: the current arms of Florence (Argent a fleur-de-lys gules); the arms of the Commune (Per pale argent and gules); the first arms of Florence (Gules a fleur-de-lys argent); the arms of the Populace (Argent a cross gules); and the Duke of Anjou (Azure semy-de-lys or a label gules). There are in addition several other coats of public interest: Gules two keys in saltire argent; Azure in bend the word Libertas argent; and Argent an eagle gules holding in its talons a dragon reguardant vert vomiting flames gules, in chief a fleur-de-lys or. But the part that I found the most interesting was the section where windows had been installed in the wall (and through the coats of arms), as you can see in the photo immediately above. Indeed, the window cut into one of the shields (the third from the right) makes it very hard to determine what it is supposed to be. I think it is: Per pale, Or three bars sable, and Azure semy-de-lys or (without the gules label for Anjou).